I want to run 4 days a week every other day, can you recommend a 10K running program with this schedule? Thanks for your 10k running program question. You have not given a tremenduous amount of detail in order for me to be able to help you out. 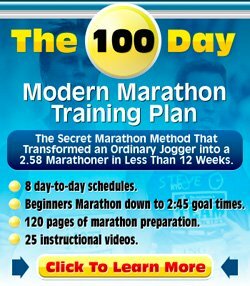 If you are already able to do 30 minutes of running, then I can recommend my 10k Running Program. This is a 10k running program that only does three days a week. But there is no pressing reason why you can't make it a four day a week program. You could do this by adding in an extra easy run. You could also compress the schedule and do the first four workouts in week 1 (i.e. the 3 workouts of week 1 and the first workout of week2), do the next four workouts in week 2 etc. A running training book that is incredibly helpful in creating running training programs for runners of every ability is Daniels' Running Formula. It has templates that allow you to build a sensible running program regardless of your mileage and the number of days in the week you want to run.